doTERRA Anti-Aging Moisturizer is packed with powerful doTERRA essential oils that are combined to improve skin tone, reduce the appearance of wrinkles, and help reduce future visible signs of normal aging. 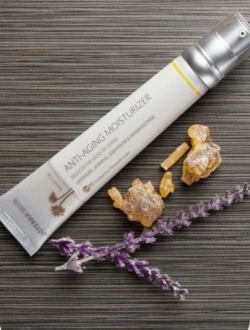 doTERRA Anti-Aging Moisturizer combines cutting-edge ingredients with the CPTG Certified Pure Therapeutic Grade® essential oils of Lavender, Jasmine, Geranium, and Frankincense to moisturize and soften skin while providing anti-aging benefits. doTERRA Anti-Aging Moisturizer targets the visible signs of aging by improving skin tone, reducing the appearance of wrinkles, and helping to reduce future visible signs of normal aging.